My Chibi Exia figure was one of my favourite figures. He was my first SD scale Gundam figure I aquired almost 2 years ago. He was cheap, easy to build and had a energetic personality that only Seravee and Double O could control. I regret to inform you call that since teaming up with Chibi Gold Frame and starting a mission to explore planet cubicle a year ago things have not been going well as elaborated on in my planet cubicle exploration update. It seems breaking his forehead fin was only the begining as the giant inhabitants of planet cubicle had even more diabolical plans for poor Cibi Exia and I regret to inform you that he has fallen in battle. This is truly a sad day but we should take heart in knowing that Chibi Exia put up a valiant fight, but he was no match for his opponent code named cHiLd. The inhabitants of planet cubicle through a procreation ritual give birth to creatures called children. During holidays these children are often released from confinement in their holding centers or “schools” and are frequently allowed to visit planet cubicle leaving destruction in their wake. 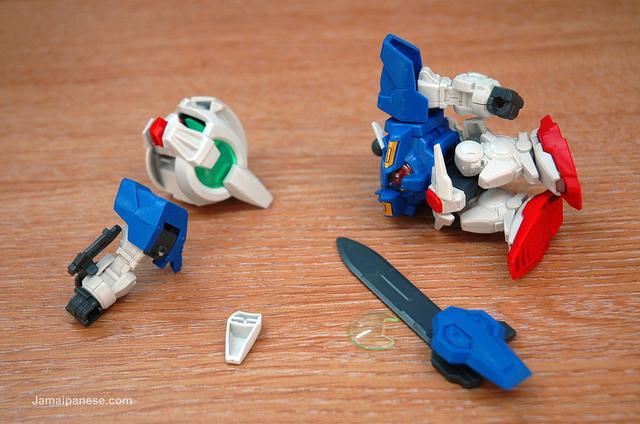 Chibi Exia fought well but had his arm ripped off and his GN Drive destroyed. 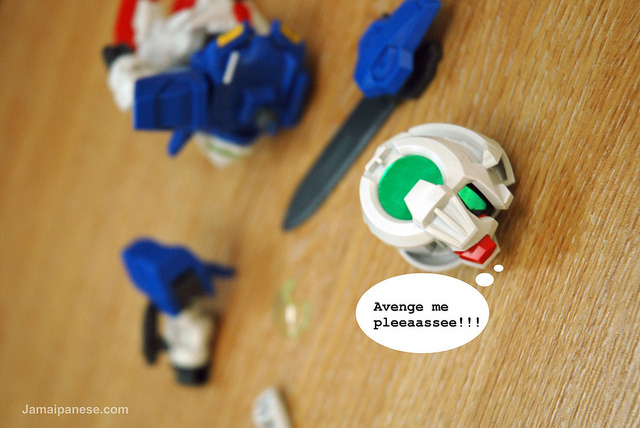 Chibi Astray Gold Frame‘s shield protected him from any major damage and he quickly retreated to a desk drawer to ride out the cHiLd attack. R.I.P. 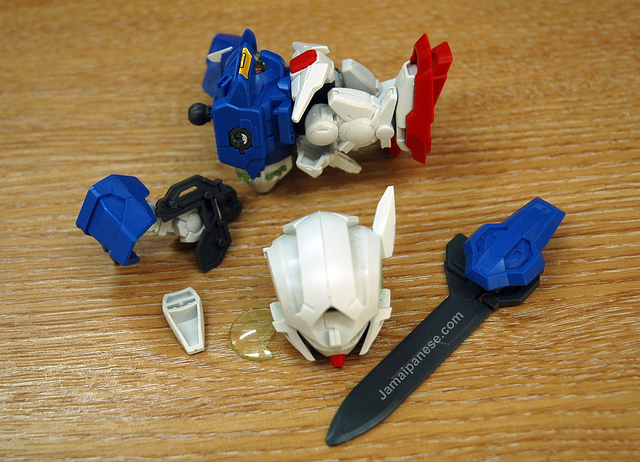 Chibi Exia, unlike when Nendoroid L lost his head but was miraculously saved your damage is fatal. Heavy Arms and Arios are hell bend on avenging him while GN-X III is trying to talk them out of it for fear of them suffering the same fate. Funeral arrangements are ongoing and details will be announced at a later date.